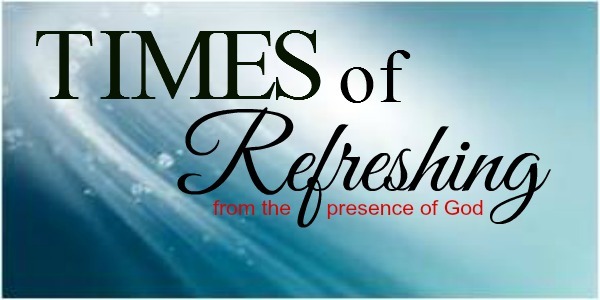 The times of refreshing in My presence are coming, says the LORD. You will not be as a parched land that cannot produce a harvest. I will open the windows of heaven and rain down My Spirit upon you and you will be fruitful. The harvest of good things is coming and will not fail. For you will reap what you have sown in tears and rejoice once again in the bountiful blessings that I will pour out to you. You will sing and dance and jump and shout, as you reap in joy that is unspeakable and full of My glory, says the LORD. I will dry your tears, and turn your sorrow into joy, says the LORD. For the days of your mourning will be over. The dryness will cease. The fulness is coming. For you will no longer worry and wonder, for the things that you longed for, the things that you hoped for, the things that you waited for will be given to you suddenly, and you will be revitalized and rejoice as I refresh you and replenish you and fill your mouth with GOOD things, says the LORD. Thank you Father in JESUS name. Yes Lord fruitful..amen !…for your glory Lord.